View cart “Johannes Brahms: Complete Hungarian Dances, for Piano 4 Hands WoO 1” has been added to your cart. Tango is a musical genre. This statement seems almost revolutionary in an era in which that word evokes passionate movements, Argentine and Uruguayans suburban landscapes, but tends to neglect what this dance finds life from: the music. And therefore almost a blasphemous act will appear the proposal of a concert tango record, written by contemporary composers. Going deeper, will kick up a fuss the fact that the musicians in the record are Sicilians, one of whom has built the most of his career in Great Britain. Let’s say that even the composers are all Italians, and the Sunday tanguero will be taken down by tears of madness. But let’s go step by step. El Tango, this is the name of the CD, is a project that comes from the stage. Born from the precise intent of two performers of rare talent, Domenico Testaì and Davide Sciacca, to give new life to a genre more and more stranded to the role of repetitive accompaniment of dance classes by the views of conformist ‘fans’, only able to accept at the most the latest innovative flashes of this genre, the electronic ones, which have now passed the double decade of life. 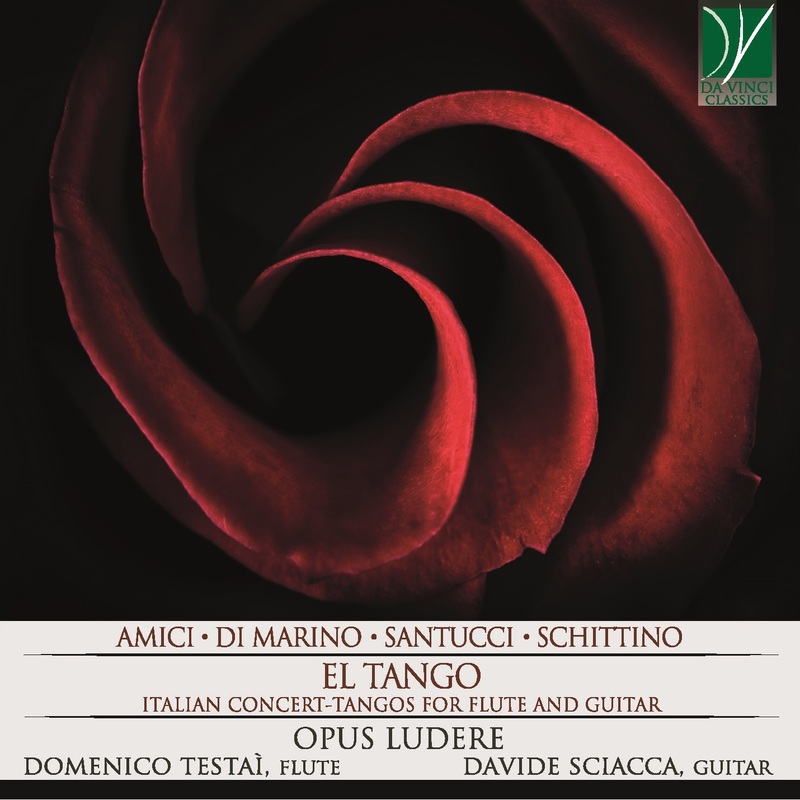 Given the moniker of ‘Opus Ludere’ (the effort of entertainment), Testaì and Sciacca decided to bring back to the fore the listening and the contemporary essence of tango, untying it from the gymnastic and geographical aspects. And they do it by drawing on the works of excellent authors, and with their support. Starting from the Roman, and Sicilian by adoption, Andrea Amici, whose work, El Tango precisely, gives the name to the record, part of the exquisite catalogue of a deep and conscious author, able to delineate a deep socio-musicological analysis. Cosmopolitan composer, Sicilian by birth but famous and very celebrated globally (starting from Germany, the motherland of so many composers), Joe Schittino joins the panel, with a tough but greatly enjoyable ‘Sdebitango’, which witnesses the astounding talent of this artist. Follows in the list Francesco Santucci, author of soundtracks and saxophonist of the RAI (the Italian state broadcaster) orchestra, some of whose works were premièred by Opus Ludere. And finally, Roberto Di Marino, born in Trentino and teacher at the Verona Conservatory, author of as much elaborate as fascinating ageless music. The result is emotion: with an open approach, ‘El Tango’ is enjoyable both by the occasional user and by the lover of art music. Nearly a ‘work by levels of awareness’, in which each listener, and for each person at every new passage, may grab something new. sit, relax, listen, and enjoy the music. Antonino Ielo: Born in Reggio Calabria, he began studying modern guitar at the age of 13 with Vincenzo Baldessarro. He then began studying classical guitar with Francesco Pepè and Adriano Walter Rullo. Master’s degree in Musical Interpretation with the highest marks under the guidance of Giorgio Albiani at the Cesena Conservatory. He participated in national and international master classes with Alberto Ponce (Ecole Normal de Paris), Angelo Gilardino, Piero Bonaguri, Oscar Ghiglia, Lorenzo Micheli, Matteo Mela, Aniello Desiderio, Giampaolo Bandini, Luis Quintero, Maurizio Norrito, Johan Fostier, Luc Vander Borght, and obtained excellent placings in national and international competitions. As part of the Erasmus project, he carried out teaching at the "Manuel Castillo" Conservatorio Superior De Musica in Seville (Spain), under the guidance of Francisco Bernier. He has been a member of the "Ensemble Macramè" with whom he has performed regularly on various occasions and concert seasons, such as "Concerts at San Donato-A.Gi.Mus Florence, 2011" and the Festival "I mondi della chitarra 2012" (Cesena), "Le nuits musical de Ciuex”. He recently won the 2015 chamber music competition dedicated to the guitarist Davide Lufrano Chavez, organized by the "G. Verdi" school from Prato. Graduated in Musical Disciplines with a Technological Address at the "F. Cilea", in 2006 he received a three-year degree in Telecommunications Engineering. In June 2016 he obtained the DSPM Diplome Superieur de Perfectiontionment Musical (DSPM) at the "Ranieri III" Academy of Monaco - Montecarlo (Principality of Monaco) under the guidance of Maestro Luc Vander Borght. Davide Sciacca, Sicilian guitarist, has been a student of the concert artist Carlo Ambrosio. He obtained a Diploma with Honours in Guitar, followed by an additional second level Academic Diplomas in Chamber Music, Teaching and Performance. In 2016 he obtained a second level Masters in Contemporary Music from Santa Cecilia Conservatoire in Rome studying with Arturo Tallini. Davide won more than fifty 1st prizes in international musical competitions. Over the years composers Andrea Amici, Laurent Boutros, Roberto Cipollina, Francesco Santucci, Domenico Scaminante, Andrea Schiavo, Joe Schittino and Giuseppe Torrisi have dedicated him original compositions. Davide’s performances have included his solo guitar concerts as well as appearances with chamber music groups, and as a soloist with orchestras in a variety of venues including theatres, cultural centres, universities and churches and cathedrals. He has also performed at the Tuscia International Guitar Festival and with the Ersu Orchestra from his home town of Catania. He regularly lectures at universities in the UK and Italy. From 2014 Davide Sciacca toured England, Scotland and Wales as both a soloist and as part of a duo with violinist Marianatalia Ruscica, playing at prestigious venues. In the years 2016 and 2017 he performed in the presence of Her Majesty The Queen, His Royal Highness The Duke of Edinburgh, HRH The Prince of Wales, HRH The Duke and The Duchess of Cambridge and other members of the Royal Family. In 2018 Davide made his debut in the United States performing for Culture Connection in New York City. After, he performed for the Ealing Guitar Society in London and the Liverpool Guitar Society. At the end of the same year he released, as part of the Counter Irish Project, a CD based on Irish traditional music, arranged in a classical and modern way. He has collaborated with actors and directors such as Michele Placido, Guia Jelo and Ornella Giusto. Davide’s repertoire isn’t confined to classical music, and he has appeared with rock and pop musicians at festivals and events including Sanremo Rock, Star Sprint, Time Tour and Girofestival, as well as working as session musician. His media appearances include work for Sky, Made in Liverpool Tv, Tele D, Rei TV, Globus Television, and BBC Radio Merseyside. Joe Schittino’s music has been reviewed in leading magazines (“Neue Musikzeitung”, “L’Opera”, “BBC Music Magazine”, “The Strad”); broadcasted by ZDF, Deutschlandradio Kultur, Hessischer Rundfunk, RAI Radio3; recorded by Tactus, Champs Hill Records, Da Vinci, RCR; published by Suvini Zerboni, Edition Gamma, Ebert Musikverlag; and performed in 14 European countries, Russia, Taiwan, Iran, Cuba and USA. Among his collaborators and performers: Novosibirsk Philharmonic Chamber Orchestra, Orchestra of Teatro Lirico di Cagliari, Italian Philharmonic Orchestra, Italian Army Band, Ensemble Algoritmo, Ensemble Calamus, Duo Narthex, Brandt Quintett; Alim Shakhmamet’ev, Fabio Maestri, Marco Angius, Mario Ciaccio, Steve Martland, Carolina Eyck, Denys Proshayev, Stanislav Chigadaev. Joe’s music was played inter alia in Auditorium Parco della Musica (Rome), Fondazione Pietà de’ Turchini, URTIcanti Festival, Cremona Mondomusica, Bibiena Art Festival, Teatro Massimo “Bellini” (Catania); London Kingston University, Cité Internationale des Arts (Paris), Centre National de Danse Contemporaine (Angers), Salle de l’Institut d’Orléans, Fondation Royaumont, Bornholms Musik-Festival, BASS 2016 Praha, ArtOrt Festival Heidelberg, Landestheater Altenburg, Museum der verfolgte Künste (Solingen), Stedelijk Conservatorium (Bruges), Conservatoire Royal de Bruxelles, Festival Het Swik (Hoogezand), Italienisches Kulturinstitut Wien, University of Michigan, O’Donnell Hall and Caruth Hall (Dallas). Joe was born in Syracuse on February 7, 1977. He gained national notoriety as an enfant prodige, a recurring guest of Italian television broadcasts (“Maurizio Costanzo Show”, 1989-95; “Piacere Rai Uno”, 1991; “90 Special”, 2018); he graduated in classical literature at the University of Catania; he studied with Luca Ballerini (piano) and Giovanni Ferrauto (composition) at the “V. Bellini” Conservatory of Catania, and he specialized with Azio Corghi and Ivan Fedele at the National Academy of Santa Cecilia in Rome (2009). In 2010 Joe was the first Italian who received a commission of the Maison d’Éducation de la Légion d’Honneur (Petite Cantate Italienne: Parigi, Concert Présidentiel 2011 with the personal patronage of N. Sarkozy). Other commissions by: Stelzenfestspiele bei Reuth (La Neuberin, two-acts opera, libretto by Klaus Rohleder), Musikverein Osnabrück, Else-Lasker-Schüler Gesellschaft, Delta Saxophone Quartet, Politistikò Festival of Cyprus University, Fondazione Luciano Benetton, Settimana Organistica Internazionale (Piacenza), Istituto Nazionale del Dramma Antico (incidental music for Le Supplici by Aeschylus, XLV Cycle of Classical Plays at the Greek Theater of Syracuse). Joe Schittino since 2017 is director of the “P. Vinci” Municipal Conservatory in Caltagirone,and teaches Theory and Analysis in Conservatories (“A. Buzzolla” of Adria, 2014; “F. Venezze” of Rovigo, since 2017).